Thirty-three ninth-graders from the Community School on Thursday began a project to keep birds and small animals from dying in vault toilets at campgrounds and trailheads on the Sawtooth National Forest. The project’s goal is to install screens on the vent pipes of 310 toilets, from Redfish Lake in the north all the way to the Utah border. According to a funding application drafted by Sawtooth National Forest Wildlife Biologist Bobbi Filbert, birds and small animals and reptiles enter the vent pipes, which resemble tree cavities and are the right size for nests, and can’t climb back up the smooth surface. They can fall into the toilet and die. Filbert said the problem is nationwide. “By capping/screening our numerous vault toilet vents, we can do our part to locally eliminate this threat, improving habitat and being good stewards to our local wildlife,” she stated. Project organizer Kaz Thea said 105 local students have signed on to help. On Earth Day, April 22, elementary students from the Pioneer Montessori School in Ketchum and sixth- and seventh-graders from the Sage School in Hailey raised $1,020 for the project through a bake sale at local supermarkets. Thea said the sale also raised awareness of the issue among local residents. Filbert’s application was for $1,500 in funds from the South Central Idaho Resource Advisory Committee, which will distribute $120,000 in federal money for forest projects in the region this year. If approved in June, the funds will be added to the bake sale money, more than $2,000 from the local Wow-Student program and $1,360 worth of Forest Service employee time to install screens this summer. Until then, the project is counting on volunteer help from the students. Ketchum District Ranger Kurt Nelson said the district has wanted to undertake a project like this for the past couple of years, but hasn’t had the funding. Thea, a former wildlife biologist with the U.S. Fish and Wildlife Service, said she has bought 100 screens from the Teton Raptor Center in Jackson, Wyo. They will be installed on 29 toilets at Redfish Lake, 30 on the Sawtooth Recreation Area in the Wood River Valley and 19 on the Ketchum Ranger District. She said receipt of the Resource Advisory Committee funds will allow the project to buy 50 more screens. Filbert said another $3,000 has been requested from the Central Idaho RAC to install screens on Forest Service land in Custer County. Thea said she got involved in the project when Teton Raptor Center founder Roger Smith, an old friend of hers, told her about the center’s Port-o-Potty Owl Project, which had the screens manufactured and began installing them on outdoor toilets in Grand Teton National Park in 2010. According to the center’s website, it has sold 2,807 screens, which have been installed in 14 states. Thea said she realized the project would be a perfect fit for the Wow-Student project, a program of the Wood River Foundation. The program grants $25 each to Wood River Valley students in kindergarten through 12th grade. The students and teachers choose a local nonprofit to which they donate the money and their time. Thea said she chose the Environmental Resource Center as the local nonprofit associated with the project. Additional students will come from an ecology class at Wood River High School and the school’s environmentally oriented W.A.T.E.R. Club. 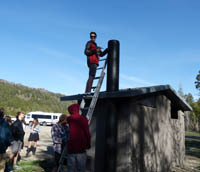 From Baker Creek, the students were scheduled to head over Galena Summit to Redfish Lake, to install toilet vents at the campgrounds and trailheads there. Thum said the kids get restless near the end of the school year, and it’s good for them to get a hands-on project in the field for a day. “It also lets different kinds of kids shine,” he said. The Sage School sixth- and seventh-graders are scheduled to install screens on toilets at Lake Creek, just north of Ketchum, on May 20. Thea said the elementary school students are too young to actually install the screens, but will go out to watch as a screen is installed in their name. Thea said she welcomes adult volunteers over the summer. She can be reached at 720-7805.